Here is the new story and the article to go with it. Yesterday the P.E.A.C.E. SCOOTER was stolen outside the place where I was housesitting. I sent out a tweet and a Facebook post, and what happened next was really quite astounding. Hundreds of people both ReTweeted and Facebooked my post about the scooter’s theft. The photo I posted to identify my scooter has been viewed almost a 1,000 times. When I walked out the door and realized that my scooter had not been towed for streetcleaning, I promptly sat down and cried. Yes, it makes absolute sense that I would be so attached to a scooter that I spent 183 days on–growing up, facing fears, having adventures. A couple of years has past since I did the peace ride though, and sometimes those memories are fuzzy. In a sense, it felt like identity theft. That scooter isn’t meant to be owned by anyone else. And what idiot steals such an identifiable scooter, huh? I sent out a text to my buddy, a local reporter who I interned for last year. He is a motorcyclist and I knew he would be empathetic to the sadness I felt, and I just wanted some support. “My scooter was stolen. I’m so sad,” I say. “Where are you now? This is the story I am going to do tonight, if that is okay,” he responds. Well, ok. I never imagined he would do a story on it. Crazy. I met up with Mark and uploaded some of my trip footage for him to use in the video. Which was fantastic to look at again, and I’m all inspired to re-edit that crappy movie I made two years ago. But I was sad looking at the scooter, thinking I might never get her back. People said encouraging things, and sent a lot of hope my way. Their digital presence put some heat on the community, and the police–at least I like to think. 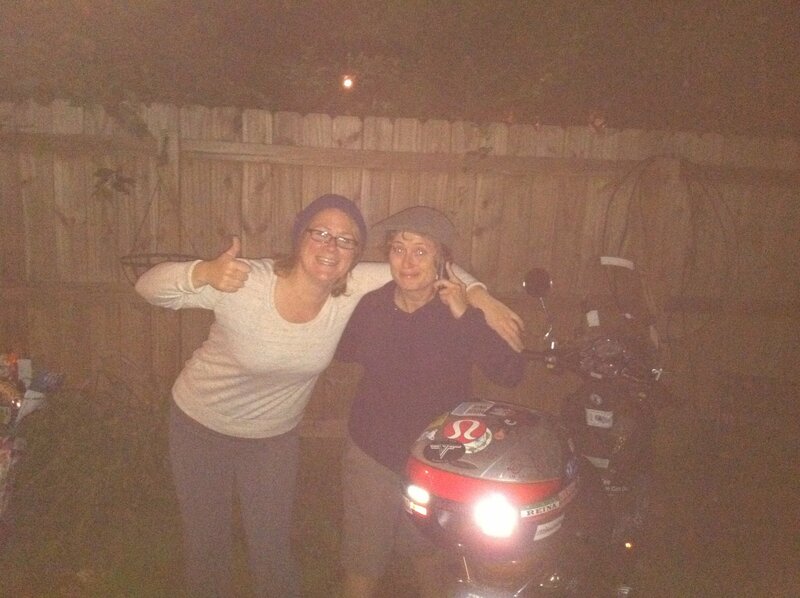 I seriously am most amazed by the amount of total strangers who helped put out the word about my missing scooter. Crazily, right before the newscast, I received a call that my scooter had been found. A police officer picked me up and ran me over to identify it. I called the station, and they were able to do an on air update to the news story. A story book ending. Interestingly enough, my co-workers at the news station learned a little about me. Many of them do not know I rode my scooter 22,000 miles for Peace. They just know I have a beat-up looking scooter with signatures all over it–a scooter only a Mom could love. The bad news–my windscreen is broken, the brake is bent and the scooter won’t start. The good news; I have an awesome scooter shop right down the street, Scoot Richmond, run by Chelsea Lahmers and crew. To consider in the future; a better lock. Also, seeing as nothing can replace the scooter I rode 22,000 miles on, maybe I should keep it in storage and buy a used scooter for town? As gas prices rise, scooter theft increases. Heck, as scooter popularity increases, so do thefts. Make sure to lock them up. Check out this awesome manifesto with tips to lock it up right. And THANK YOU to the ANONYMOUS CALLER. They allegedly heard some noise, which was the scooter being stashed in a dark, long, tiny alley–one block away from where it was originally stolen. Realizing that the scooter didn’t belong to anyone in the building, the person called the police. I do not know what the person who stole my scooter intended to do with it. I will never know. I do know that it came back home within 12 hours, and I am so thankful to have it back.